Before Risk, before Dungeons & Dragons, before Magic: The Gathering, there was Diplomacy. One writer enters international competition to play the world-conquering game that redefines what it means to be a geek (and a person). It was the summer of 1909. I was on the south coast of Spain. I remember it well because the season was almost over. Peace was within reach, I felt. There had been a vote to end the war, and the English had told me to support it. But the vote needed to be unanimous to pass, and it failed. The Russian, the Italian, they thought the English voted against it and that I had been lied to. Why should I believe them? The English and I had worked together against all of them for years now. Of course they’d want to sow distrust between us. Now time was ticking. I desperately wanted peace. I wasn’t sure my country would survive another couple of years, with or without England’s help. There wouldn’t be another vote until after the fall. “Will you support my army in Spain this fall?” I asked. “Nah. That ain’t happenin’,” the Englishman replied. A wave of dread came over me. He intended to betray me. And with that he walked away, leaving me standing in the hallway, mouth agape. He rejoined the other players at the board, who all stared at me, fury in their eyes. We told you so. For the past eight hours I had been in the basement of a dorm in Chapel Hill, North Carolina, playing a board game called Diplomacy along with six other men. Each of us was vying against 80 other people to be crowned the world champion of Diplomacy at the end of the weekend here at Dixiecon.1 One of those men, Brian Ecton, a high school math teacher from Prince George’s County, Maryland, with hair like Katt Williams and a mouth to match, approached me right at the start, sizing me up as a beginner and offering an alliance. He explained exactly how it would work and said we’d share a draw at the end. I had no reason not to agree. For the next several hours each of the other players would take turns dragging me aside to explain to me how Brian was manipulating me, how he was going to betray me, how I should betray him first and work with them against Brian. I dismissed them all. After all, who’s to say they wouldn’t betray me as well? I was outmatched in this game. Safer to pick a player and stick with him come what may, I thought. But here I stood, on the verge of elimination, and the other players were pissed. According to them, I could have avoided this if I had listened to them hours ago. If you’ve ever heard of Diplomacy, chances are you know it as “the game that ruins friendships.” It’s also likely you’ve never finished an entire game. That’s because Diplomacy requires seven players and seven or eight hours to complete. Games played by postal mail, the way most played for the first 30 years of its existence, could take longer than a year to finish. 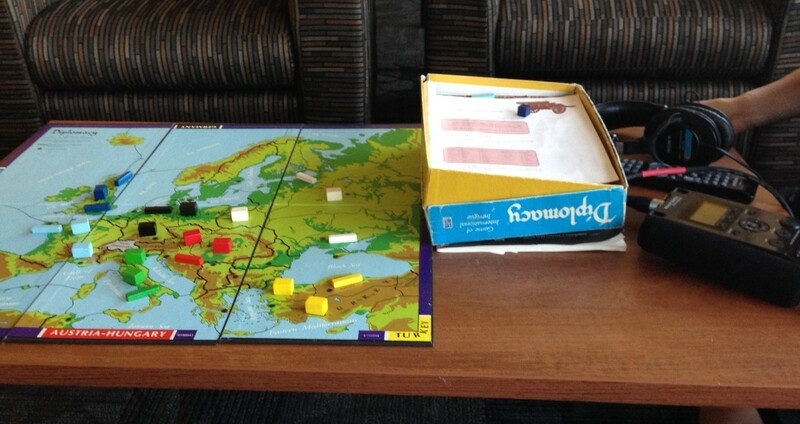 Despite this, Diplomacy is one of the most popular strategic board games in history. Since its invention in 1954 by Harvard grad Allan B. Calhamer, Diplomacy has sold over 300,000 copies and was inducted into Games Magazine’s hall of fame alongside Monopoly, Clue, and Scrabble. The game is incredibly simple. The game board is a map of 1914 Europe divided into 19 sea regions and 56 land regions, 34 of which contain what are known as “supply centers.” Each player plays as a major power (Austria-Hungary, Turkey, Italy, England, France, Russia, Germany) with three pieces on the board (four for Russia) known as “home supply centers.” Each piece can move one space at a time, and each piece has equal strength. When two pieces try to move to the same space, neither moves. If two pieces move to the same space but one of those pieces has “support” from a third piece, the piece with support will win the standoff and take the space. The goal is to control 18 supply centers, which rarely happens. What’s more common is for two or more players to agree to end the game in a draw. Aside from a few other special situations, that’s pretty much it for rules. There are two things that make Diplomacy so unique and challenging. The first is that, unlike in most board games, players don’t take turns moving. Everyone writes down their moves and puts them in a box. The moves are then read aloud, every piece on the board moving simultaneously. The second is that prior to each move the players are given time to negotiate with each other, as a group or privately. The result is something like a cross between Risk, poker, and Survivor — with no dice or cards or cameras. There’s no element of luck. The only variable factor in the game is each player’s ability to convince others to do what they want. The core game mechanic, then, is negotiation. This is both what draws and repels people to Diplomacy in equal force; because when it comes to those negotiations, anything goes. And anything usually does. The year was 1966. A 17-year-old boy named Edi Birsan was sitting in his room in Brooklyn staring at a letter he received in the mail. He scanned the same sentence over and over: I am not against a three-way draw and I will not take any more supply centers … On the table in front of him was a Diplomacy game board, showing a game at about the midway point. Two years before, Edi’s mother had split. She and Edi’s stepfather’s marriage had been on the rocks for years. They’d fight, break up, get back together, lather, rinse, repeat. One day in 1964 she forged Edi’s signature on a bank slip and withdrew $5,000, the entirety of a savings account Edi had had since he was 9 years old, and eventually lit out for California. She stopped off in Tijuana for a Mexican divorce, and that was that. By his own admission, Edi was introverted and repressed. A year after his mom took off, Edi was in therapy. His therapist saw in him a need to channel his bottled-up aggression, and to learn how to trust people again. She gave him a gift — a board game. I read in a magazine that this was Kennedy’s favorite game. They’d play it in the White House.3 She told him it would help him deal with betrayal. Edi had a hard time rounding up seven people with whom to play the game. Eventually he discovered that most people played through the mail. He sent off a couple of dollars to subscribe to a magazine (or zine, as they were called) that collected and published the moves submitted by postal players in various games. In between issues Edi would correspond with the other players by mail, laying out his grand plans and coaxing people into alliances. He’d spend hours crafting the perfect letters to his fellow players, carefully choosing his words and taking care to describe how his strategy would benefit them both. He was usually good at it, too. And he prided himself on being a decent and trustworthy ally. Edi took out scissors and a pen from a drawer and set to work on the letter, painstakingly doctoring it. When he was finished he held up the letter proudly and read it to himself. I am against a three-way draw and I will take three more supply centers … He put the forgery in the mail to the third player. Then he waited. Allan Calhamer invented the game in 1954 while he was still a law student at Harvard. He aimed to sell it to one of the major game companies, but they all passed. In 1959 he self-financed 500 sets and sold them all to toy stores around New York. The game was picked up in 1961 by a small game publisher called Games Research. But because of how difficult it was to organize seven people for an entire day to play a game, sales were less than brisk.4 It looked like Diplomacy wasn’t long for this world. Until the nerds saved it. John Boardman was an editor of a number of amateur science fiction fanzines in 1963. In those days, pre–Star Trek, science fiction was still a highly niche subculture. Ever since the 1930s, fanzines were the primary way that sci-fi fans communicated and shared stories and ideas. John Boardman was also a fan of the game Diplomacy, but had a difficult time getting players together for a game. But he had an idea: He’d publish an ad in one of his sci-fi fanzines to see if anyone was interested in playing by mail. The response was encouraging. In May 1963, Boardman organized the first play-by-mail game of Diplomacy and the first Diplomacy zine, Graustark. Within four years there would be at least 32 more zines filled with postal Diplomacy games. Soon Games Research started promoting playing the game by mail by including the names and addresses of the zine editors with the game. In 1976 the rights to the game were purchased by Avalon Hill, one of the largest publishers of strategy board games and war games in the world.6 The company had also started a gaming convention the year before in Baltimore called Origins. It invited the Diplomacy community to hold DipCon at Origins II, and the result was the largest Diplomacy tournament ever held in North America, with around 230 players. With Avalon Hill’s support and reach, Diplomacy found an international audience and rapidly grew in popularity in Europe, particularly in the U.K. The game’s core community was still the editors and readers of the amateur zines, however. Through writings in those zines by new international players, the idea was floated that there should be a tournament in the U.K. In 1988, the first ever World DipCon was held in Birmingham, England, with the site rotating to a different country every year thereafter. Since 1988 the World DipCon has been held in 10 different countries. The winner of World DipCon is accepted around the world by the Diplomacy community as the official world champion. The gathering of amateur diplomats for the 2014 World DipCon was a fairly homogeneous group. Among the 87 players were only two women, two players under the age of 21, and four African Americans, including 2005 Dixiecon champion Brian Ecton.9 The players were as you’d probably expect from any international gathering of board gamers: bookish, unkempt, and slightly awkward. There were exceptions to these stereotypes, to be sure. If there was one thing that this particular group of nerds was not, it was nebbish. Nolen got hooked on Diplomacy when she was 13 years old. Her father had brought her to a gaming convention called Conquest. She was a bored adolescent wandering around the convention with her brother, not interested in playing any of the games. Then she came across six people sitting at a Diplomacy board, many of them not much older than she was. The oldest player, a man in his fifties, beckoned. “We need one more player.” Nolen looked at the board, the pieces, the players. On the face it looked like another boring war game like her dad played. “No way am I going to play that,” she replied. But Diplomacy was different from any game she had ever played. It wasn’t just tactics, just pushing pieces on a board. In fact, it was barely that. It had a human element. She found that in her very first game she was able to win against older, more experienced gamers just because she was good at convincing them to help her out. She was captivated by it. The older player asked her if she’d like to play again sometime and asked her for her email. His name was Edi Birsan. One thing that Birsan was sure of was that the game was better when played face-to-face. He much preferred the tournaments and house games he traveled to over the games played by mail. With the advent of the Internet, face-to-face Diplomacy had been dwarfed by the volume of people now playing the game over email. So much so that an email game had been organized to pit the top email players against the top face-to-face players. Birsan was one of those face-to-face players. And he wasn’t happy about the way this game had been going. Birsan picked up the telephone and dialed 411. He asked for a number in Houston, wrote it down, and then hung up the receiver. He took a deep breath, then picked up the phone and dialed. It was well past one o’clock in the morning in a suite on the second floor of our dorm when someone first suggested that we vote for a draw. My first match at Dixiecon had begun around 7 p.m. and there had been only one player eliminated from the game in six hours. Of the six of us remaining, one player, a former world champion named Chris Martin, was playing as Italy and down to a single unit, an army stuck somewhere in Austria. Without any other pieces to lend himself support, Martin was as good as eliminated — unless he had an ally to keep him in the game. Martin, who has a PhD in dance, is a soft-spoken, fast-talking charmer whom other Diplomacy players call “the newbie whisperer” because of his affinity for allying with inexperienced players and getting them to do his bidding. He revels in this. Martin was knocking on death’s door when he convinced me, Siobhan Nolen, and a University of Arizona economics professor named Mark Stegeman to keep him alive. His reasoning? None of us was good enough at the game tactically to survive the alliance of the other two players, whether we stuck together or not. He had a point, even if it was completely self-serving. The other two players on the board were Toby Harris, a top British player whose shaved head gave him a passing resemblance to Jason Statham and who was one of the favorites (along with Martin) to win the world championship; and Andy Bartalone, a Mack truck of a man with a booming voice and a penchant for booze and gambling — everyone affectionately called him “Buffalo.” Toby and Buffalo were not interested in any six-way draw. Their proposal? Kill Chris Martin and split it up five ways instead. More points for everyone! Nolen looked at us and shrugged, then followed Harris and Buffalo out to the hall. When they returned, we looked at Nolen for any sign that she had flipped on us. Everyone wrote their moves on small slips of paper and put them in a box. Then Martin pulled them out and read them aloud. Nolen didn’t break. The alliance held. Harris was livid. “Can I talk to you for a moment?” he said to Martin. And the two best players walked out in the hall together, leaving the rest of us alone with Buffalo. The room fell silent, save for the sound of Buffalo’s heavy, labored breath. Stegeman would speak first. “I don’t see why we continue to play. We’re just wasting time. We all want the draw. This guy wants the draw.” He motioned toward Buffalo. “Come on. You want the draw. You should, anyway. You don’t want to play until five in the morning.” Stegeman was insinuating that Buffalo should be happy with a six-way draw, perhaps that he was fortunate to even be in the mix. Buffalo blew his top. Nolen and I looked at the older, affable Stegeman, she with irritation, me with fear. This was no longer fun. It was just tense and weird. I saw this happen over and over again throughout the weekend. Players would get so angry because other players wouldn’t cooperate with them that they would take to shouting, browbeating, cursing, making insults. Often the anger was directed at players known as “alliance players,” or, more pejoratively, “care bears”: players who refuse to break alliances and will play only for draws. Dave Maletsky sat in the parking lot of the dorm in a beach chair he’d brought with him to the tournament. He’s a large man with glasses and a thin beard. He wore an enormous straw hat — nearly a sombrero — a yellow Hawaiian shirt, shorts, and sandals. He looked like he’d be just as comfortable at a Jimmy Buffett show as a Diplomacy tournament. Why water down the game for the weaker of heart? Because while tens of thousands play Diplomacy over email, the face-to-face game is struggling. That’s not just because of how much easier it is logistically to play over email. It’s also because the more emotionally traumatic elements of the game are intensified when you’re face-to-face with your opponent. And when the game is for points in a tournament with ego and a title on the line? “A lot of times players just lose their minds,” Maletsky said. “There’s a guy here who last time we were together he was so mad he chucked a book at me,” said Haver. “When I saw that, I laughed, because ‘I win.’” For my part, I found it hard to laugh at rattling people to their emotional breaking point. As much as I was fascinated with this game, even the psychological elements of it, I was taken aback at how often players — even at the highest level — were pushed beyond their ability to think of it as just a game. Every single person I spoke with at Dixiecon told me the same thing, that to enjoy Diplomacy you need to leave all of that stuff on the board. After the 10th person told me, “We always go get a beer afterward,” I started to think it was less a practical maxim and more a personal mantra. It was a lot easier said than done. “This hobby has a real problem with player retention,” said Maletsky. “It’s easy to get new players into the game, but it’s hard to get them to come back.” Fans of role-playing games enjoy the social aspect but dislike the tactical elements. Eurogamers are interested in Diplomacy’s unique game mechanics but dislike the fact that there is player elimination and direct conflict with opponents. But for most people, the problem is always the same: Diplomacy is just too intense. One thing that struck me about this divide: Of the players who expressed the most discomfort with the cutthroat nature of the game, despite their skills and their reputations, none had ever won a world championship. Another late night at Dixiecon, about three o’clock in the morning. It was so late, the nightly poker game had already wrapped up and most of the recreational drinking had moved to the bar across the street or into the dorm rooms. Thomas Haver was still playing Diplomacy, though. His game had been going for more than eight hours. 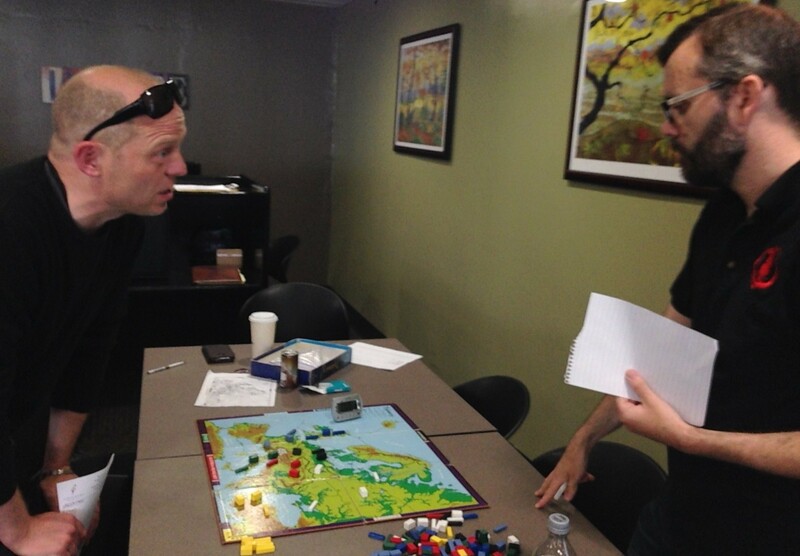 He was playing as Russia, and his ally, a Canadian player named Chris Brand, was playing as Turkey. They had allied right from the start — an alliance known as “the juggernaut” in Diplomacy parlance — and had been pushing through the board all night. They eliminated Austria quickly, but the other players saw the juggernaut and moved quickly to work together to try to stop it. In a situation like this, in which a two-person alliance is taking on the whole world, what is required of the two allies is complete trust. To build that kind of trust, you need to make sacrifices for the good of the alliance. You need to refuse to grow too strong to keep your ally from worrying you might betray them. You leave yourself as vulnerable to an attack from them as they are to you. If an ally asks you for something — even if it means an imbalance in the relationship, that they grow a little stronger than you — you give it to them to build the trust. If you make a deal that you’ll work together and share the victory, you have to mean it when you say it, and show it in your actions. Act as if a gain for your partner at your expense is a wash. This is care bear diplomacy. This is how Thomas Haver plays the game. And at that late hour in that Chapel Hill basement, it appeared to be working. Haver and Brand’s juggernaut was nearing the end of what would surely be a two-way victory for them both. There was just one more move to make. And that’s when Thomas Haver saw it. Brand likely saw it, too. He was too good a player to not see it. But at that point he had come too far. He couldn’t defend against it. He could only hope that Haver was as much a care bear as everybody said, and would keep his word that they’d go for the two-way. But there was no denying it — Haver could solo this board on the next move. When the moves were read, Brand was crestfallen. Haver stabbed his partner and took enough supply centers from him and the other players to secure 18 units and the elusive solo victory. It was worth 270 points, enough to win him the tournament and the world championship. As Haver retired back to his dorm room for a couple of hours’ sleep before the next morning’s game, he ran into Brand in the hallway. “If you want some revenge, I guess you can choke me now,” Haver joked. Brand was in no mood to kid. He wasn’t angry, just in a state of shock. Staring off into the distance, he mumbled, “I’m just trying to figure out what I could have done differently … ” He entered his dorm room and closed the door. What likely rattled Brand wasn’t the complexity of his question, but the utter simplicity. What he should have done differently was to not trust Thomas Haver. Today Edi Birsan still plays Diplomacy, and had entered this event, though he wasn’t really playing to win. He had won enough trophies over his lifetime. Besides, he had recently been elected to the city council of Concord, California, where he lived, so he was putting his diplomatic skills to some real-world use now. I had sought out Birsan after struggling to keep my emotions in check over the course of nonstop rapid-fire lying, arguing, and humiliation for the past 24 hours. I needed to know from the man who everyone from Thomas Haver to Chris Martin told me was the greatest Diplomacy player alive — was I not cut out for this game? Is the only way to be good at Diplomacy to be good at lying and manipulating others? Birsan didn’t think so. After all the anger, the manipulation, the frayed nerves, and the hurt feelings, I was left feeling something wholly unlike boredom, but something also unlike fun. My opponents were right: I was too trusting, too unwilling to lie, too willing to settle for draws. I was not thick-skinned. I was not an alpha nerd. But I comforted myself with the thought that even though I wasn’t, neither were my pissed-off opponents. If they were, they’d have persuaded me to do what they wanted. My poor decisions were as much their fault as my own. This was the soft-bellied credo of a broken ego, but it was all I had left. One day I hope Chris Martin’s son and I can meet each other across the board, maybe at another World DipCon. When we do, I hope we can look each other in the eye, shake hands firmly, and keep our word to one another. We may not win the tournament, but we’ll know we aspired to play in a way that we can be proud of. There are a number of Diplomacy tournaments around the country, each with its own name. Dixiecon is a yearly event in Chapel Hill organized by the Carolina Amateur Diplomats, or CAD, a Diplomacy club that started on the University of North Carolina campus in the 1980s. This year Dixiecon was chosen as the host site of the World Diplomacy Championships, or World DipCon. The winner of Dixiecon would also be considered the world champion. In the Diplomacy lexicon, to “stab” is to betray someone. In addition to JFK, Henry Kissinger had said it was his favorite game. It has been said that Calhamer had to cajole his best friends at Harvard to play with him in order to test the game. Few of them enjoyed playing. It was at the 1972 DipCon that avid Diplomacy player Gary Gygax first unveiled Dungeons & Dragons. Because of the obvious influence Diplomacy had on the D&D game system, it was a huge hit. Avalon Hill published many of the first board game war simulations, including Tactics and Gettysburg. It later acquired the rights to blockbuster strategy games like Acquire and role-playing games like RuneQuest. Hood brought her to read the names of all the players for the first board of the tournament. In 1990, Dixiecon served as the host of the first World DipCon in North America. Diplomacy isn’t the only game played at Dixiecon. There are a number of other board games played and awards given out. It was difficult to know who was there for the Diplomacy tournament and who was there for other types of board gaming. Calhamer had been known to compete in tournaments from time to time, but he was never considered a strong player. He also never made much of a living off the game. The royalties he earned from it were never enough to support him. Despite a degree from Harvard, Calhamer spent some time on the dole in New York City, and at the time of his passing in 2009 had retired as a mail carrier in Illinois. The scoring system at every tournament is different, which is one of the central frustrations within the Diplomacy hobby. The result is that many players who don’t study the finer points of a given event’s scoring system may make bad decisions that stem from their misunderstanding of how they will be scored. In this particular situation, Martin took advantage of that and misled the players about the value of killing him. Had he told the truth, or had any of us understood the points at stake, he likely would have been eliminated. Solo victories, in which one player gains 18 supply centers, are incredibly rare in tournament play and as such are often rewarded with a large number of points. How often players will even try for solo victories depends on the tournament scoring system and how heavily solos are weighted over other outcomes. At Dixiecon, a single solo victory could be enough to put someone in the top three spots, regardless of how they do in their other games.